Rick Brainard, the infamous, short-lived Grand Junction, Colorado City Councilman who was arrested for assaulting his girlfriend four days after he was elected to City Council last April, has gotten a job with KaiserAir in Santa Rosa, California as Director of Maintenance Marketing and Business Development. His arrest in April, 2013 stunned the community and galvanized hundreds of citizens who protested in front of City Council and worked tirelessly over the next four months to oust him from Council. Brainard insisted on taking his seat on Council despite his arrest and guilty plea. After citizens formed a recall committee and it appeared his recall was imminent, he finally stepped down from Council on July 18, 2013, but claimed his leaving had nothing to do with the months of protests against him. 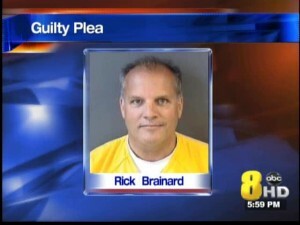 Brainard was fired by West Star Aviation and pushed off several prestigious local boards after his guilty plea.